Sphero, maker of iOS-connected robot toys, is bringing The Force to Apple Stores this Friday when it introduces BB-8, a rolling ball model named after the astromech droid from Disney's upcoming film Star Wars: The Force Awakens. At $150, the miniature BB-8, complete with magnetically-attached head and gyroscopic drive system, is one of the most expensive products to launch as part of today's massive Star Wars merchandising blitz dubbed "Force Friday." However, in marketing the "toy" as a premium device with iPhone and iPad control capabilities, Sphero nabbed coveted Apple Store shelf space. BB-8 is basically an upgraded version of the Sphero 2.0 rolling robot, which encases a small electric drive system with wheels, motor and circuitry in a tough plastic shell. Adding a magnetically attached head to the mix, along with some unique Star Wars graphics, imbues a certain amount of personality, but with BB-8, software is the real star. Sphero uses clever behaviors to convey emotion, like tilting BB-8's head using the internal gyroscopic drive system, or illuminating a red LED, wobbling and producing beeping noises to express anger after hitting a wall. The device feigns artificial intelligence with a Patrol mode and limited voice control, while the accompanying app includes a nifty augmented reality feature that simulates holographic video chats onscreen. Users can create, send and view messages in-app as though BB-8 is projecting the video on a nearby object. Sphero claims BB-8's behavior will adapt as users interact with it, though the extent to which the device changes is unknown. It is possible that future software updates will unlock even greater autonomy and a more varied set of responses. On the hardware side, BB-8's battery is good for about an hour before it needs to be set back into its inductive charging cradle. Bluetooth Smart connectivity offers remote controlled rolling up to 30 meters for iOS and compatible Android devices. 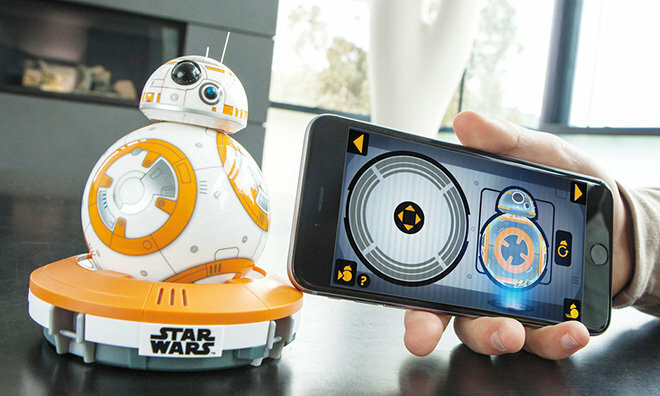 Sphero's BB-8 droid is available today at the Apple Store, Best Buy and Sphero's website.